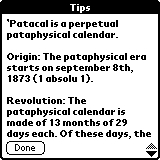 'PataCal provides the current date in the pataphysical calendar. 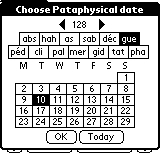 It also allows you to choose the date (in either the pataphysical or the vulgar calendar) that will be displayed. also displays the saints (beware some can shock some people). It is only useful for those who read french. is the desk accessory version of patacal.prc (it requires a separate desk accessory launcher). The two first share the same identifiers and data structures so it is possible to switch from one to another (but not to have both running on the same machine). The desk accessory have another identifier and can be used separately. 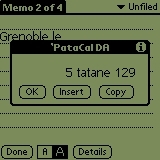 The software "'PataCal" described by and downloadable from this web page, hereafter named "the software", is Copyright (C) 2000-2002, Jérôme Euzenat. The software can be downloaded, executed, copied, modified, free of charge under the express condition that this legal notice remains with it and that all the copyright statements remains clearly visible. All express warranties and all implied warranties, including the warranties of merchantability and fitness for a particular purpose, of the software are disclaimed by the author. The software is meant to be used by computer professionals able to evaluate the risks faced. The author is not liable for any damage whatsoever, direct or indirect, resulting from the use, reuse or performance of this software or its modified versions. By using the software, the user agrees to be bound by the terms of this notice. The author reserves the right to revise these terms at any time without notice by modifying the content of the present legal notice. All company and product names may be trademarks of their respective owners and are gracefully acknowledged. The previous versions can be downloaded from the history section, they are available in source format with all different prc included. as it is said in Alfred Jarry, Les gestes et opinions du Dr Faustroll (Gallimard/Poésie). 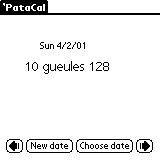 'PataCal is based on the fourth edition of the official calendar of 1971 (4th edition) as reproduced in the magazine littéraire n°388 of juin 2000. Origin: The pataphysical era starts on september 8th, 1873 (1 absolu 1). Revolution: The pataphysical calendar is made of 13 months of 29 days each. Of these days, the 29th are imaginary days (hunyadis) but the 29th of gidouille and that of gueules in leap years. So the pataphysical years is of 365 (13x28+1) days long (366 on leap years). Peculiarity: all 13th days are fridays. 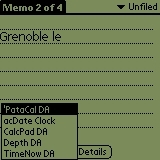 'PataCal is registred with Palm under the PtCl creator identifier. The desk accessory version is registered under PtDA. 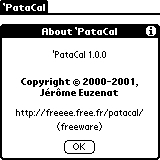 'PataCal is freeware. If you like it, drop a mail to freeee À free . fr. You can notify bugs and comments to freeee À free . fr. Please, for bug reports, provide the kind of machines, extensions (memory...), OS version and revision, hacks and circumstances (available memory). 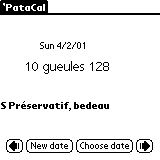 completely replace the Palm date by the pataphysical one (in particular, place the begining of the date era to the 1st absolu 1, instead of the arbitrary 4th décervelage 31). rewrite the program in a pure pataphysical programming style (i.e. which generalises exceptions and turn them into rules -- so that bugs, which usually occur at the limits are lost in the middle of nowhere).